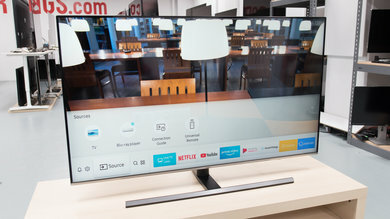 $2,000 can buy you some of the best TVs on the market, packed with features so that you don't have to make compromises, no matter your usage. 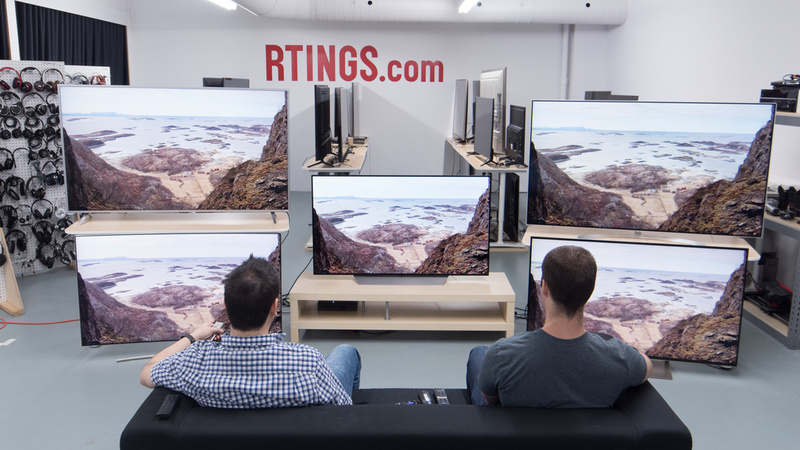 You can find great TVs from the mainstream 55 inch size all the way up to whopping 75-inch ones. It all boils down to what you want. We've tested 80 TVs and below are our recommendations for the best TVs under $2000 you can buy in 2019. The LG OLED55B8 is the best TV under $2,000 that we've tested. 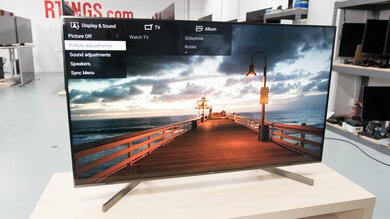 It is an excellent TV (the LG OLED55C8PUA is just as good, but it is more expensive) with remarkable picture quality. The emissive OLED technology allows it to display perfect uniform blacks as it can switch off individual pixels. It has a wide color gamut that makes HDR content look great with rich, saturated colors and highlights that pop. The TV has excellent reflection handling, and the image remains accurate when you watch from the side, due to the wide viewing angles. Just like most OLEDs, the LG B8 has an almost instantaneous response time and a low input lag which will please most gamers. Unfortunately, when displaying static content over extended periods of times OLED TVs -and the B8- have the risk of temporary image retention and permanent burn-in. We do not expect this to be an issue with normal, varied use that most people do. Overall, the LG B8 is an excellent TV for almost any usage. If the possibility of burn-in with the B8 concerns you, the Samsung QN55Q8FN is the best LED alternative. This 65" LED TV delivers great picture quality, with an outstanding native contrast ratio, decent local dimming feature, and excellent peak brightness in SDR. Both PC and console gamers will appreciate the excellent low input lag and outstanding response time. It also supports FreeSync VRR, great for Xbox One S/X or AMD graphics card owners. It also has an optional game mode motion interpolation feature, great for reducing stutter on older game consoles without adding too much input lag. Unfortunately, unlike the OLED B8, the QN55Q8FN loses accuracy when viewed at an angle, so the best seat is reserved for those sitting directly in front of it. If you want something a bit bigger than the B8, the Sony XBR65X900F is the best 65 inch TV under $2000 that we've tested so far. It delivers great overall picture quality, with an excellent native contrast ratio, wide color gamut, and outstanding peak brightness in SDR. The X900F has excellent motion handling, thanks to an outstanding fast response time, so fast moving objects look great, with very little blur trail behind them. It also has a nearly flicker-free backlight, so there are no duplications in moving objects. Unfortunately, the picture on the X900F degrades when viewed at an angle, which may be disappointing if you have a room with a lot of side-seating. Overall, though, it is a great TV that should please most people. 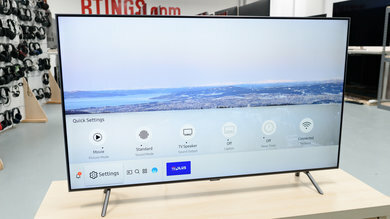 If you want a cheaper TV that will perform similarly to the Sony X900F, get the Vizio P Series 2018 P65-F1, although it may be hard to find in stock. You will not get the excellent reflection handling of the XBR65X900F. On the upside, the Visio P65-F1 is a great TV with a good picture quality and deep blacks, thanks to a high native contrast ratio and very effective local dimming. It has a very low input lag, which makes it a great choice for gamers and in general, it is a great TV for most uses. 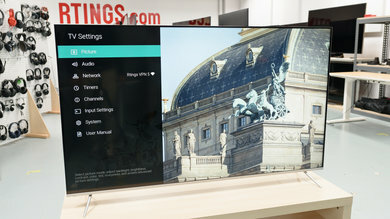 If you want a much bigger screen size than the LG OLED55B8, the best 75 inch TV under $2000 is the Samsung UN75NU8000. 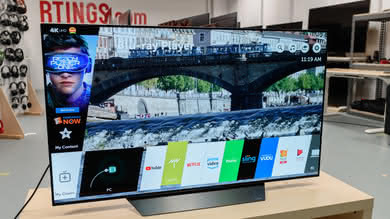 It does not have the excellent picture quality or perfect blacks of the LG, and it is not a good choice for a room where people will be watching from the side, as the viewing angles are not good. On the upside, it is a large screen TV with a good picture quality and deep blacks, thanks to the high native contrast ratio. It has a fast response time and only a small blur trail is visible in fast-moving content. The NU8000 has a low input lag and support for the FreeSync implementation of the variable refresh rate. These features make it a great choice for gamers. Overall, this large TV has a good performance in most uses. 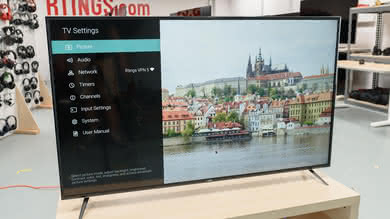 If the Samsung UN75NU8000 is too expensive, get the Vizio E Series 2018 E70-F3, although it may be hard to find in stock. It cannot get as bright as the Samsung nor does it support any variable refresh rate implementation. On the upside, it has an okay picture quality with deep blacks, thanks to the high native contrast ratio and local dimming support. It has a fast response time, a good implementation of Black Frame Insertion, and can make the image look crisper. Our recommendations above are what we think are currently the best TVs under $2,000 to buy for most people. We factor in the price (a cheaper TV wins over a pricier one if the difference isn't really worth it), feedback from our visitors, and availability (no TVs that are difficult to find or almost out of stock everywhere). If you would like to do the work of choosing yourself, here is the list of all our reviews of TVs that are less than $2,000. Be careful to not get too caught up in the details. While no TV is perfect, most TVs are great enough to please almost everyone and the differences are often not noticeable unless you really look for them.